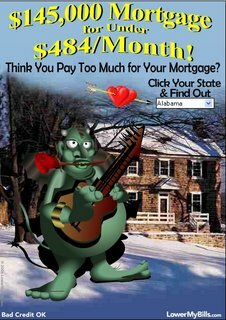 Celebrity endorsements are hard to come by in the mortgage refinancing business. Getting a whole team to advertise your product can be pretty hard, so LMB just goes with one representative of the team. But somewhere down the creative chain of command, the message was lost. The head honcho must've said, "Let's get the Mighty Ducks to endorse us". 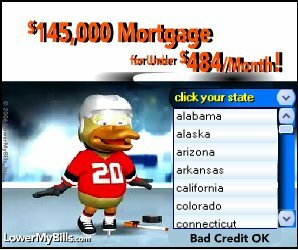 The Flashmakers took that too literally and ended up with a duck dressed up in hockey garb. And the duck can't even skate! With arms akimbo, the duck gingerly balances itself, ready to bite the ice at any moment. The job of an LMB ad collector is never done. Despite his diligence in constantly scouring the left, right and top banners of a thousand web-sites, some LMB ads still escape his roving eyes. But providence and similar-minded people help the LMB ad hunter, as shown by this post. Alert LMB spotter Dave mailed this gem, one that would've been blasphemy to miss. Exemplifying what we've all come to admire about LMB, here's the ogre of love. 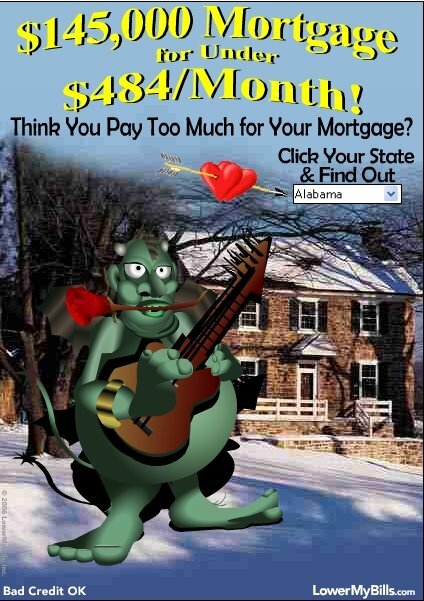 A regular Don Juan, this green monster serenades the ladies with his power ballads of lower mortgage payments. Which thick-skinned level-60 orcess wouldn't swoon to his songs?